Volkswagen India today launched a 'fully loaded' offer for its highest selling cars  the Polo and the Vento. Volkswagen also offers the Jetta, Passat and Touareg in India. Car enthusiasts can now own the Polo or the Vento by paying 20% of the price as down-payment and the remaining amount over a period of 36 months with Equated Monthly Installments (EMI) of Rs 9,999 for the Polo and Rs 14,699 for the Vento. As part of this limited period offer, customers can avail car finance, annual maintenance contract and free benefits, which include insurance, extended warranty and road side assistance for 3 years, all in a single EMI. This offer will be valid for the Polo and the Vento bookings from July 8, 2013 to July 25, 2013. The Polo and its booted stable-mate Vento are available in numerous variants. Options are available in engine capacities, transmissions and fuel options. The Polo comes in with 3 engine and 2 transmission options. The Vento has 2 engine and 2 transmission options. Both cars have both petrol and diesel models. 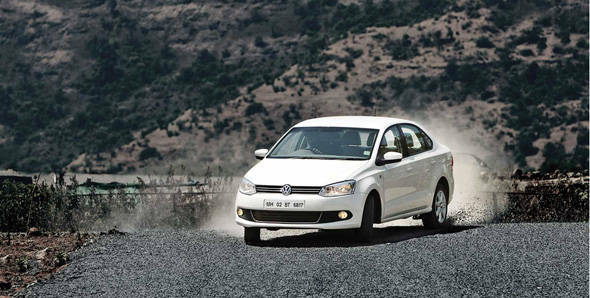 The Volkswagen Polo price ranges from Rs 4,81,670 to Rs 8,09,848. The Vento starts at Rs 7,29,344 and goes up to Rs 10,00,627. All prices are average ex-showroom.